Ibrox Noise: Who partners Martin Skrtel? 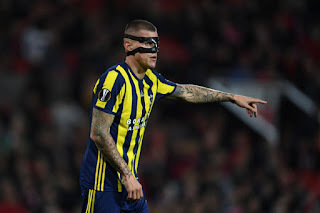 As most Rangers fans will know, Rangers are on the verge of securing Martin Skrtel, a badly needed defensive colossus, as their new defensive leader. Fans will remember him vividly from his Liverpool days, and there is no question Rangers are getting a truly outstanding defender of the calibre we definitely need. No more David Bates. However, at the moment, his defensive partner is somewhat up in the air. Rangers only have two recognised senior defenders in Bruno Alves and Fabio Cardoso, and while in theory a Skrtel Alves duo seems rather massive, in reality it’s not the quickest and they’re surely too similar. Meanwhile Cardoso struggled terribly at Ibrox in every sense last season. So who gets the nod? Gerrard has been linked heavily with Brighton’s Connor Goldson and West Ham’s Reece Burke. Goldson has been reportedly priced at £2M by the Seagulls, and while the 25-year old is a fine defender, it remains to be seen if Gerrard agrees on the valuation. Meanwhile Burke is seen by a clutch of Championship sides as a solution for their defences and Rangers would face strong competition for his services – the trail on that particular deal has gone very cold. So, as of present, it appears it’s Skrtel, Alves, Cardoso and Goldson assuming the latter gets the nod. Personally we’d make the duo the two new boys, Skrtel and Goldson – if Alves or Cardoso want their place (back) they need to earn it. And neither has come close to doing so. Who would you guys want as Skrtel’s partner? Hi Jamie, problem with big Kyle is all the interest there seems to be coming from his agent, rather than Stevie G. We were hesitant about including him until we know our manager is genuinely interested. Do you really think McCrorie will be a starter in midfield, at the expense of who? If not, I'd like to see him build match experience at the back, next to Skrtel who can cover for him. McCrorie is never a centre back and we have no time for him to learn his trade in the first team. Well I'm hoping or should I say praying Cordoso is well gone by June the 2nd! Alves should go to Qatar/ China and Finnish his career. Four fighting for 2 jerseys. Burke's went cold because WHU are weighing up whether to send him back out on loan or punt him. Young Reece is well thought off down Englandshire way, if the Hammers let him go we certainly will meet stiff competition for his signature. ££££ will also be a factor and a possible Vito!!!? Plus WHU have just appointed their new manager so he might still have a future at the Club.. Defo need quality over quantity.. What about the young CB who’s just signed new contract and bossing it with D - Squad? Mccrorie or Wilson who will add pace , anyone but cardoso I'm 61 and a better centre half than him . Doubt Alves will be back after World Cup and you couldn’t pair him with Skrtel as this would give us a problem with pace. Cardosa we have to punt as he is just not suited to the Scottish game. For me this means we need to be signing three central defenders! Gareth Mcauley at West Brom! Is on the bench, relegated, Northern Ireland international, about 8ft tall..would stroll it up here. Nobody would pass him, guaranteed a few goals aswell. Well...its unanimous........sign Kyle Bartley, he is the one the fans want.. I am not certain that Skrtel will be as good as everyone thinks. This time last year it was all about Alves, the European Champion - and he has been crap.